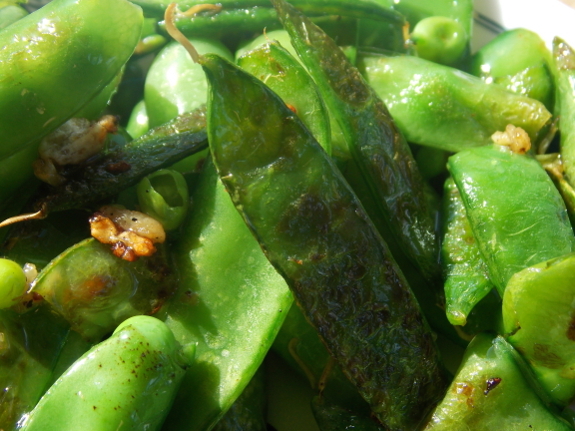 In their prime, it seems like sacrilege to cook sugar-snap peas. But I allowed a few frosts to damage the last peas before we picked the vines bare last week, which means that the peas we harvested were subprime. They were still crunchy and sweet, but the pods had started to turn a bit fibrous and the aesthetics were much reduced (as you can see to the right). Time to saute the remaining vegetables with garlic and turn so-so fare into a feast! 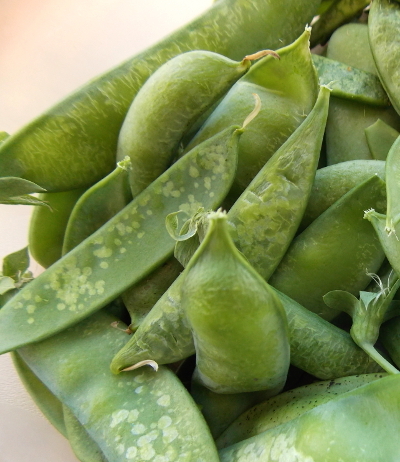 Excellent sugar-snap peas can be used whole, but if yours are turning fibrous like ours were, you'll want to string the pods as if they were beans. Otherwise, leave the pods whole and drop them into a skillet full of a little hot oil. Turn down the heat to medium-high, add the garlic, salt, and pepper, and cook for about five minutes (stirring often) until the beans turn bright green. Voila! Deliciousness from so-so produce! Now, with the last of the summer bounty down the gullet, it's time to eat up all of those stockpiled cabbages. How timely! I just bought a bag of peas because my daughter was excited to have them in her school lunch. I snacked on some the other day and thought they were awful! 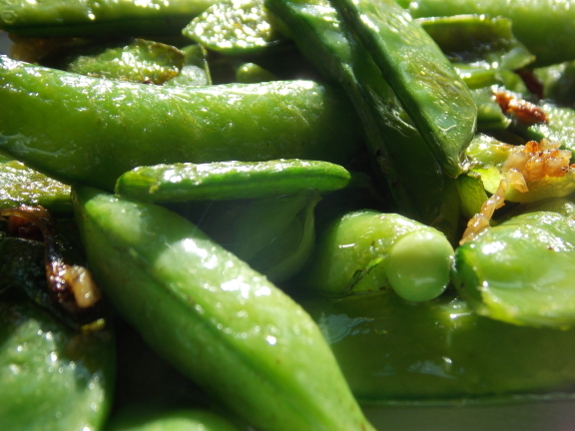 I guess I have always had garden fresh sugar snaps! While she seems to like them raw in her lunch, I think I will cook up the rest. Somehow I would prefer that she developes a palate for fresher food! No more buying out of season!